The Program provides a reconstruction option for homeowners to demolish their flood-damaged home and construct a new residential structure. 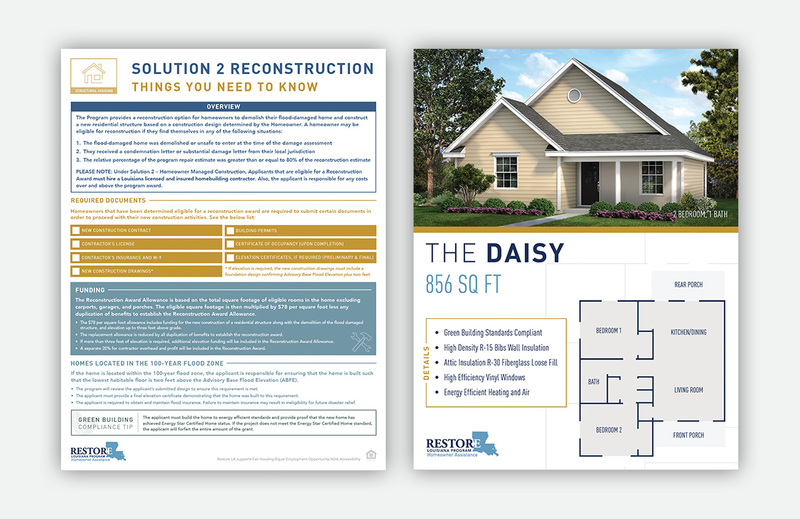 Homeowners may allow the Program to manage their reconstruction project under Solution 1 or hire their own Louisiana licensed and insured homebuilding contractor under Solution 2. Reconstruction estimates are based on the total square footage of the eligible rooms of the original damaged home, excluding carports, garages, and porches. A reconstruction floor plan will be determined by the Program during the application process and communicated to an Applicant at Award Acknowledgement.